1. The window just stopped while I was shopping. Why? During high volume of traffic the page appears blank or the window automatically stops, you can close the window and access our site once again from the start. The products in the shopping cart will be empty or deleted once you close the window. 2. The window takes forever to change. 3.The window just stopped while I was shopping. Why? 4. The time-out screen is displayed while I was shopping. 5. Can I use your site on a Mac? Yes, you can use the site on a Mac. 6. The window just stopped while I was shopping. Why? 7. I forgot my member ID. Click the [Login] button at the top right of our home page, and click [Forgot Password], enter your registered email address at the "Forgot Password" section your password will be emailed to your registered email address. 9. I cannot complete my registration! 10. Do I have to get registered at www.giftwithluv.com for online shopping? 11. What kind of benefits can I get if I become a registered member? Registered customers can use our shopping service. Those who wish to receive our newsletter will also receive promotional news about new arrivals, sales etc. 12. I want to change my e-mail address. Please use your new address to e-mail us at info@giftwithluv.com for Login ID, old e-mail address and new e-mail address, date of birth and your full name. Please login to your account and go to “ My Account” and edit your information. 14. Can I change my password as often as I like? 15. Is it possible to have several Member IDs? We suggest that you do not create more than one member ID. This will help in keeping track of your account and the daily transactions you make. 16. Can I register again with the same email address I used before? 17. How to order on Giftwithluv? When you place your order on www.giftwithluv.com, you will receive an email confirmation from secure connection. Customers can surf and select products from product category and click on add it to your shopping cart, multiple products can be added at any given time in your shopping cart. Fill the order details once you are ready to buy and click on continue, you can view your ordered products by clicking on preview and then click on confirm. Customers will be redirected to payment page for further information about your order number and order status. 18. I want to check if I succeeded my order or not. You may check your order by two ways described as follows. 1)"Order Confirmation" should be sent to your registered email address. If you do not receive this email, please contact at info@giftwithluv.com stating with your Member ID, Order ID and your name. 19. Any information required from my end to submit the order? Yes we require the following information such as: Receiver’s name, address, contact number, message on the card, product specification. Sender’s name, contact number, shipping address and billing information. 20. The procedure after I place my order? Once you place your online order it is directed to secure connection to Techprocess or CCAvenue the payment gateway system. After your order confirmation you will receive a confirmation email from us to your email id. Once www.giftwithluv.com receives your payment you will receive another email, in case of any difficulty during order our customer support team will approach you through email or telephone. 21. Exact delivery date of my order? You will be asked for a request delivery date after you place the order. Same day delivery is promised if we receive your order before 2.00pm, to track your order you can mail at info@giftwithluv.com. 22. Where do I receive my order number/ sub order number? you will receive your order number on your registered contact number or e-mail id once we receive your confirmation and payment for the order. 23. Am I eligible to cancel or change my order information? Customers are free to cancel or change the order with prior indication provided we have not yet processed with your order. 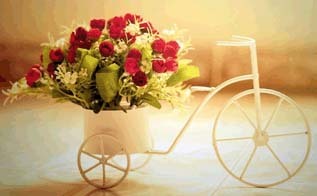 You might want to reach www.giftwithluv.com through email or call us on 9243284333 before the planned delivery. We will continue with the order whenever you want. 24. Will I be able to change the sender’s name? A. Yes you can change the sender’s name by sending changed order information to www.giftwithluv.com or contact us through phone on 9243284333 a day prior for the scheduled delivery. 25. Will I be allowed to change the billing address? You are free to change the billing address and inform us at www.giftwithluv.com or call us on our contact number 9243284333. 26. Will I be allowed to change the billing address? 27. Is there a possibility to change the products? Yes you can change the gift/quantity of flowers/different flavor cake according to your specification. You can mail or call us on 9243284333 for further changes in the products. 28. Can I change the receiver’s address and contact number? You can change the receiver’s address( it should be in same city) and contact number with prior information by sending a mail regarding the correct address and contact number on www.giftwithluv.com or call us on our mobile numbers 9243284333. 29. What are the modes of payments available? You can avail the leading national and international credit cards such as American Express, Master Card, Visa; debit cards/net banking to pay for your order, customers can also pay through mobile banking or deposit cash in our bank account. 30. Is there a limit to how much I can purchase? No, there is no limit to how much you buy. You can shop till you drop! 31. Is security guaranteed for my information? Your information is secured with us; www.giftwithluv.com will allow you to enjoy online shopping. Our site is secured and privacy is the top most priority in electronic information being transferred over the internet for commercial purpose. Information entrusted with us will be safe and secured as customers are very important for our services. 32. Using credit card online is safe? After you complete your order form preview your purchases, we will not proceed until we receive the payment at www.giftwithluv.com. Leaking of your information is out of question; your order will be forwarded to the payment gateway where your private information such as credit card details will be processed by payment gateway using SSL with view to your order. 33. Exact delivery date of my order? 34. Where do I receive my order number/ sub order number? 35. Am I eligible to cancel or change my order information? 36. Will I be able to change the sender’s name? Yes you can change the sender’s name by sending changed order information to www.giftwithluv.com or contact us through phone on 9243284333 a day prior for the scheduled delivery. 37. Will I be allowed to change the billing address? 38. Is there a possibility to change the products?